Is it fishing bobbers or fishing floats? "It's six of one, a half dozen of another" my father used to answer to this type question. Whatever you call them bobber fishing has evolved into a sophisticated tool for catching bass when used in the right conditions. They control the depth of the bait and serve to tell you when you're getting a bite. They give you control when fishing around grass, sunken brush and other cover types. They allow you to "suspend" your bait directly over fish-holding cover and structure that might prove a "snag hell" for other type rigs. If you fish rivers floats can enable you to effectively cover eddies around timber, large boulders and bridge pilings. 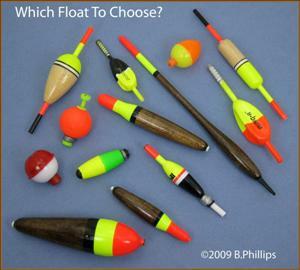 Fishing bobbers or floats are manufactured from balsa, plastic, foam and cork. They're round, pear, pencil, and barrel shaped. A recent wrinkle is the introduction of what might be called "bubble" floats. Floats are designed with great consideration of how they will perform in wind and current. They should not be easily blown away from the target area by wind nor quickly swept away by current. They should ride in the water such that the water line is at the point where there is a line separating the two colors of the float. These devices are often round and have recessed hooks on the top and bottom through which the angler runs his/her line. To do this, the button on top, which is spring-loaded, is depressed exposing the hooks on both the top and bottom. When exposed, line is easily run through them and once the button is released the hooks retract into the float. At this point the bobber is securely "fixed" on the line. Others can be found with external springs that accommodate fixation by sliding over the line after it's placed in a notch on the stem. What's the most common mistake made when using fishing bobbers whether fixed or sliding? Using a float that is too large. Rule of thumb is to use one which is the smallest size you can and still have the float ride high on the surface while remaining very sensitive to the slightest tug from below. If your float is too large there will be too much resistance when a bass takes the bait and it will likely release the bait in response. After Bass With Shiners? Where Round Bobbers Are At Their Best! 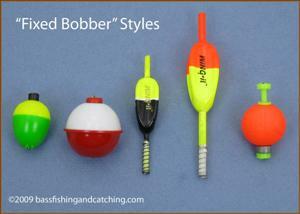 The "fixed" bobber is an all around good bobber, be it round or oval. They're usually thought of as fishing bobbers for panfish. They're effective, however, when used with shiners or other baitfish for catching bass in shallow water 5' or 6' deep. Bait can be suspended square in the face of shallow water bass with a fixed bobber rig. However, casting can be difficult with five or six feet of line hanging below the bobber. A "lob cast" is the necessary casting technique for fixed float rigs. 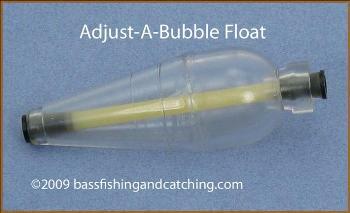 Also, make sure the bobber you choose is large enough to prevent the shiner from pulling down the float. That's the bass' job. When fishing shiners "fix" your bobber 2' to 4' above the hook and place a split shot, sufficiently large to keep the shiner down, 8" to 12" up the line. If the shot is too light the shiner may head for the surface, though this isn't necessarily a bad thing as bass will sometimes hit them on the surface. Nothing wrong with that. Fishing bobbers that are fixed float rigs can be very effective for suspending a 4" shiner just above grass or other cover such as brush, laydowns and shallow stumps. I use 10lb monofilament, sometimes fluorocarbon, line with a No. 1 Gamakatsu Shiner Hook. Make sure your shiners are fresh and lively. If their actively swimming they will attract attention so keep them moving. If they stop give the bobber a little tug and they'll usually start moving again. If not, get a fresh one. Fixed float rigs are usually presented with no retrieve. Just cast them out and let them sit. You can give them a gentle twitch with your rod tip in order to jiggle the bait. You can also move them with a sweeping motion, reeling in the slack and again letting the bait settle down in a stationary position. When fishing bobbers you will often get a warning that the bait is being investigated by or nibbled on by a bass. The float will "jiggle" in the water. Setting the hook is simply waiting till the bobber is pulled down or moves off to the side then yanking hard. The beauty of a slip float for bobber fishing is its ability to present a bait at most any depth. 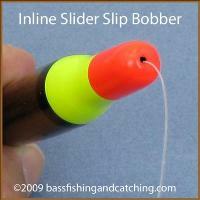 The slip bobber is just that, a bobber that freely slides (slips) up or down the line. What are the mechanics of a slip bobber? Since the bobber itself has a central line channel through which the line slips, when you prepare to cast, the hook, bait, sinker and float slide near the end of the line, unlike a fixed bobber rig. This makes a slip float rig much easier to cast. When the float is cast and hits the water the line is pulled through the center channel by the weight (shot) until the "stop knot", often called "bobber-stop", reaches the float. At that point it does just that, stops the line from running out any farther. Why? Because the knot of the string bobber stop is larger than the diameter of the hole in the end of the float's interior line channel. 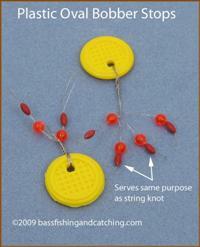 When assembling a slip float rig the bobber is threaded on the line first followed by the bobber and hook. Then place a weight about 6" above the hook. If using live bait, like shiners or creek minnows, tie on a No.1 Gamakatsu Shiner Hook. The last thing to do is tightly tie on a string at a point up the line and ahead of the float at the depth you wish to fish. For example, if you wish for your bait to be down 6' you place your string bobber stop 6' up the line. Even though your knot is tightly tied you will still be able to adjust depth by merely sliding it up or down the line. Slip float rigs are very effective when targeting bass found around shallow weed beds, among large rocks, cruising large flats or holding close to stumps, as are fixed float rigs. But the nature of their design enables the angler to go after bass in these cover types even in deeper water. When I'm fishing bobbers I always anchor my boat within easy casting range of my target. Casting is best done with a sideways motion, not an overhand lob. Swing the rod backwards on a sideways plane. When you reach the end the back swing thrust the rod tip forward toward your target with a slight upward motion while releasing line. These are critical components of slip bobber rigs. 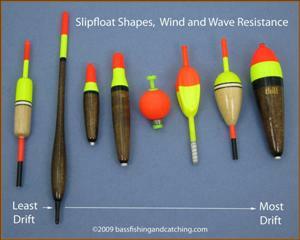 They are what control the working depth of the rig and without them you lose the entire purpose of fishing with floats. "String" slip float bobber stops can be hand tied on your line with three overhand knots but if you fat fingered like me you may find it easier and faster to just use commercial bobber stops sold in packages of 10 to 50. These are pre-tied string, usually pink or yellow in color, on short pieces of small diameter, round plastic tubing. Also included in these packages are little round "stopper" beads. Adding a bobber stop to your slip float rig. Run the line through the small plastic tube before sliding on the float then slide the pre-tied knot off the tube onto the line. Slide the little tube off then tighten the knot in place. Add a bead to your line. This bead has a very small hole through which you run your line but which is smaller than the knot. The bead itself is larger than the hole in the float line channel. So when the bead "seats against the float it fills the hole and stops the knot. There is another commercial version of bobber stops that consists of very small beads packaged on looped wire. 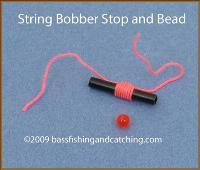 These oval beads serve the same purpose as the stop knot of a string bobber stop. To get these on your line merely run your line through the wire loop and pull the little plastic stop and bead onto your line. You will think there is no way this will work but the bead slides on like a charm. When fishing bobbers always take into consideration wind and wave conditions. Pencil shaped or otherwise slim versions offer less water resistance so slip under the water much easier on a strike. Additionally, they offer less surface area for wind to carry them off target. Standard round, squat shaped floats are more resistant to movement by wind but will travel across the water at a reasonable rate in "strong" winds when desired, as when fishing across wide flats. This shape is good when fishing bobbers for deep bass. They're best suited for light rigs. Because of the center hole design, which creates an acute angle in your line between you and the bass, setting the hook can prove problematic. It's best to keep your targets close when fishing this style bobber so as to avoid long hook sets. The best all-around slip float choice when fishing bobbers. They're heavier than many so cast easier and for greater distances. The center line channel allows line to slip through with ease. Their shape is also one which is less vulnerable to unfavorable wind and wave conditions allowing it to stay "on target" better. The bulbous bottom of this design keeps its buoyancy below the surface with but a small tip showing above. This means minimal wind resistance. Additionally, there is little water resistance when taken by a bass or any other fish. This means there is less chance they will drop the bait. A nice design feature of this float is the external hole (located at the bottom tip) through which you run your line instead of through a center channel. The advantage with this is that it reduces the angle in your line between you and the fish. Hook setting is much more sure even at long range when fishing bobbers of this design. This larger design is a good choice when fishing bobbers with larger baitfish or plastics like a Senko. If you're fishing where there are "big" bass this float will serve you well. Very good in still water and does well even in moderate wind and waves. This style float truly added something new to fishing bobbers. They're hollow and designed so water can be put inside it. This added weight makes them quite easy to cast. Once on the water they lie on their sides rather than upright as with traditional floats. When taken by a bass (or panfish) the water inside will rush into the "fat" end the float which immediately tilts upward. At this point set the hook, don't wait till the float is pulled under. This design works well with jigs and plastic baits as well as with live bait.